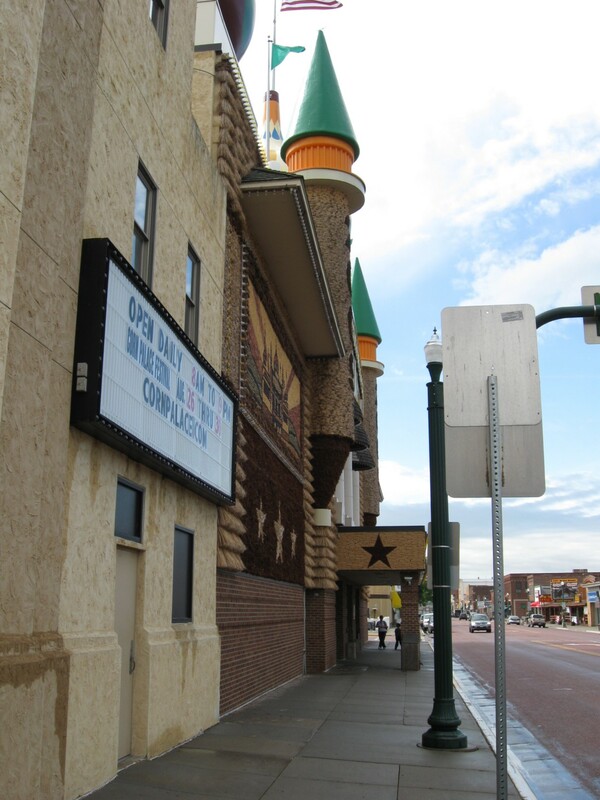 Our 2009 Road Trip, Part 7: The New Cornographers « Midlife Crisis Crossover! DAY FOUR: Monday, June 15th. 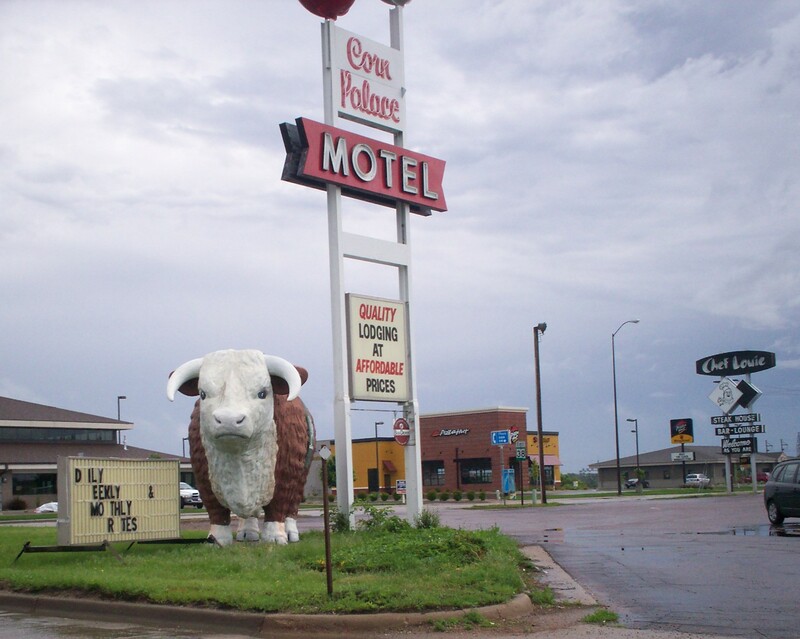 A day full of mesmerizing sights began an hour west of our Sioux Falls hotel in the town of Mitchell, which missed a real tourism opportunity by never declaring any sort of affiliation with the MST3K episode of the same name. Clever sights dot the landscape to and from their big yellow centerpiece. Their Chamber of Commerce welcomes any visitors. Frankly, they’re all ears. 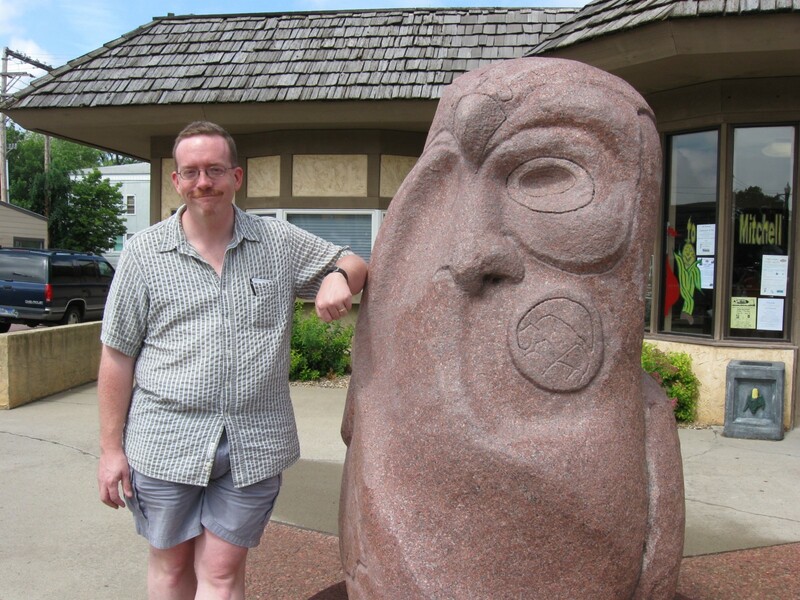 Native art, or possibly a deformed philosopher’s stone. 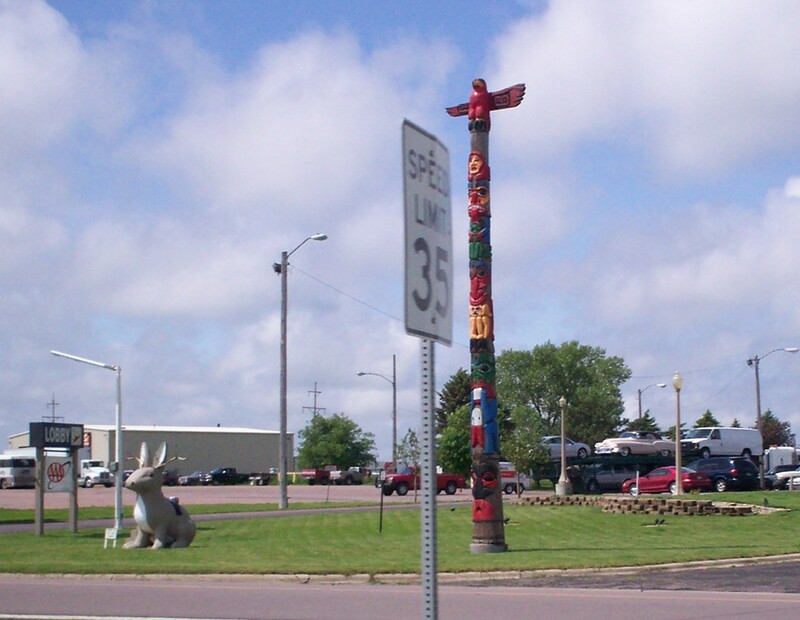 Totem pole standing next to the first jackalope we saw on this trip. The herald of the many South Dakota bison in our future. 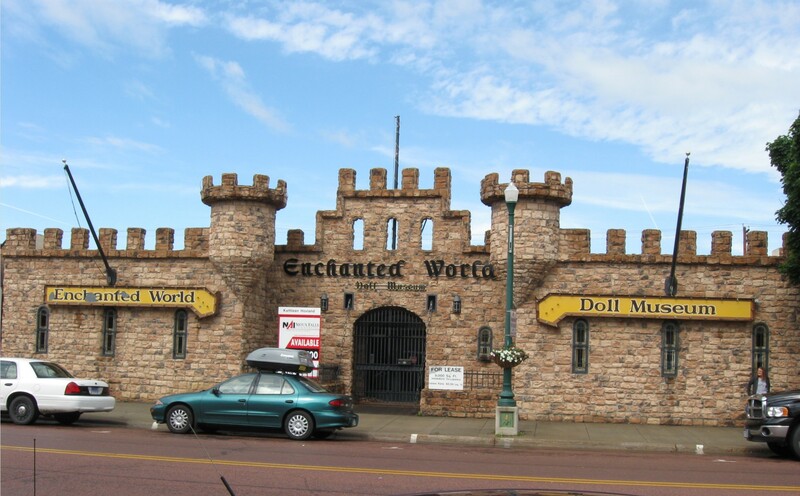 The Enchanted World had gone out of business well before our arrival, up for sale to anyone with an enterprising spirit or a Medieval Times franchisee license. 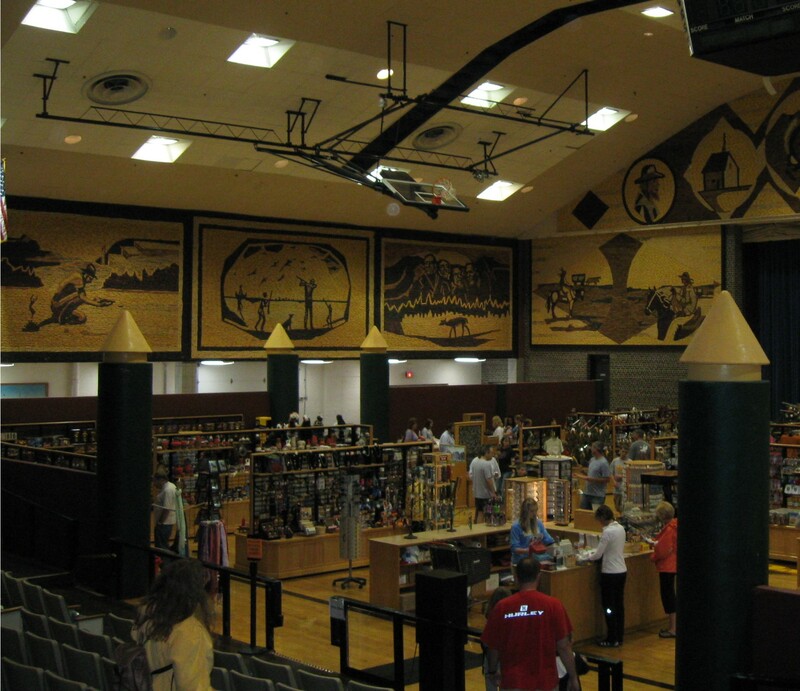 For those who visit their local library or internets to read more about South Dakota, the Mitchell Corn Palace is one of the early search results, once you bypass the famous monuments and tribal reservations. 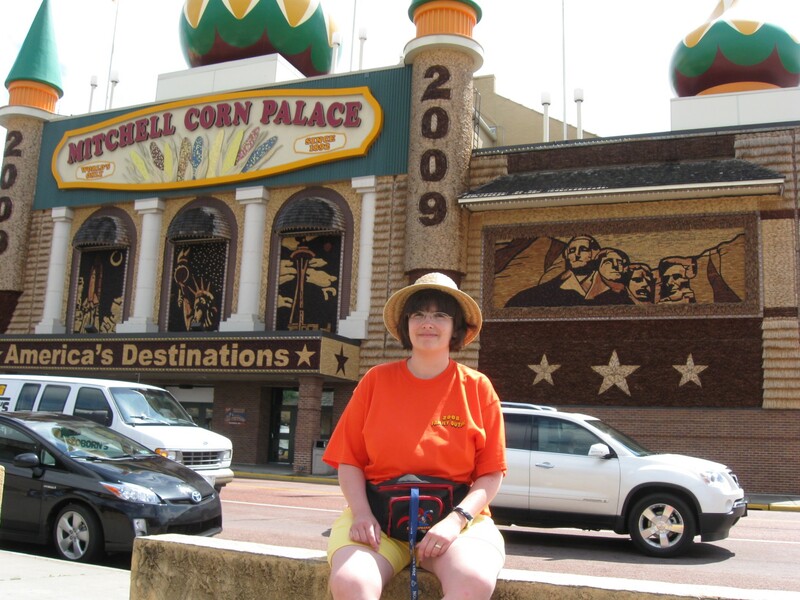 The words “corn” and “palace” share next to nothing in common, but Mitchell wields the power of synergy to fuse the two simple yet incongruous concepts into a bizarre performance-art piece and creative small-town moneymaker. 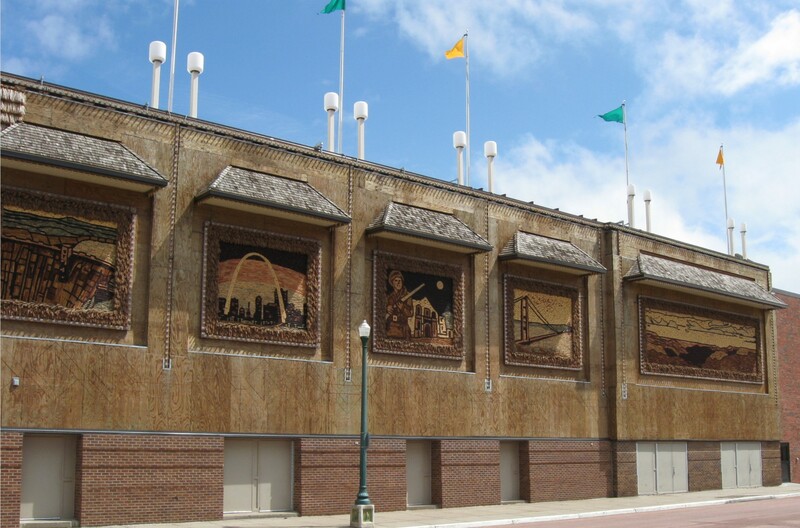 It’s a large building decorated with murals made entirely from corn. 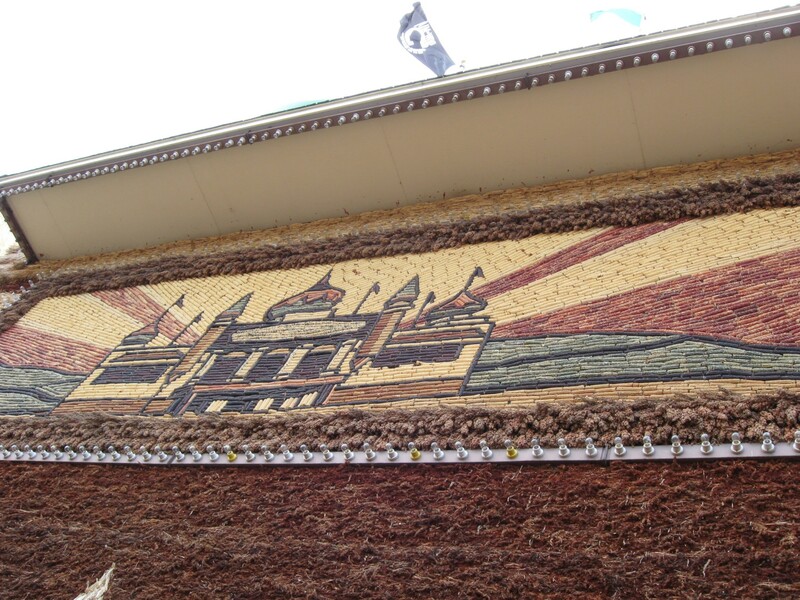 The corn is refreshed and replaced regularly; the mural designs change every year. It was free. We weren’t about to turn it down. 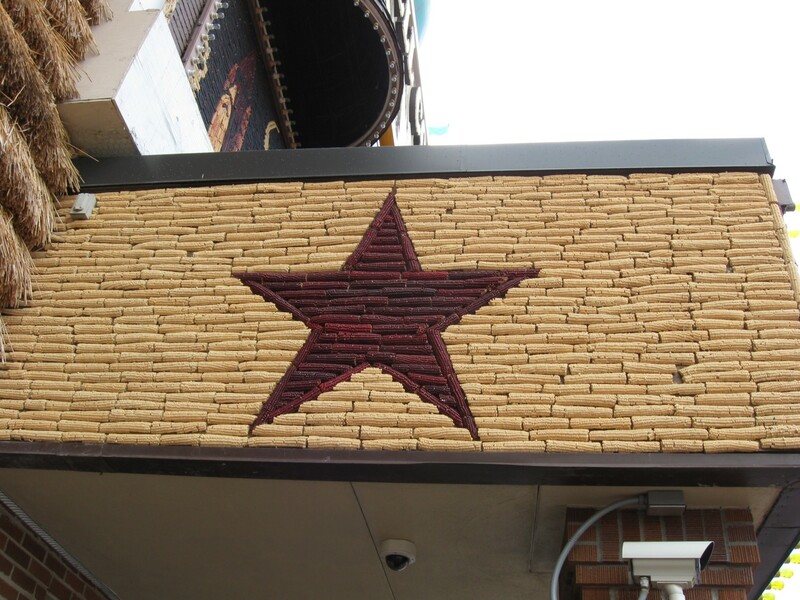 Lots of hot corn pics viewable for free, including this shapely corn star. Slightly better view of the towers from the side. …the Hoover Dam, the Gateway Arch in St. Louis, the Alamo, the Golden Gate Bridge, and either the Badlands or the Black Hills. 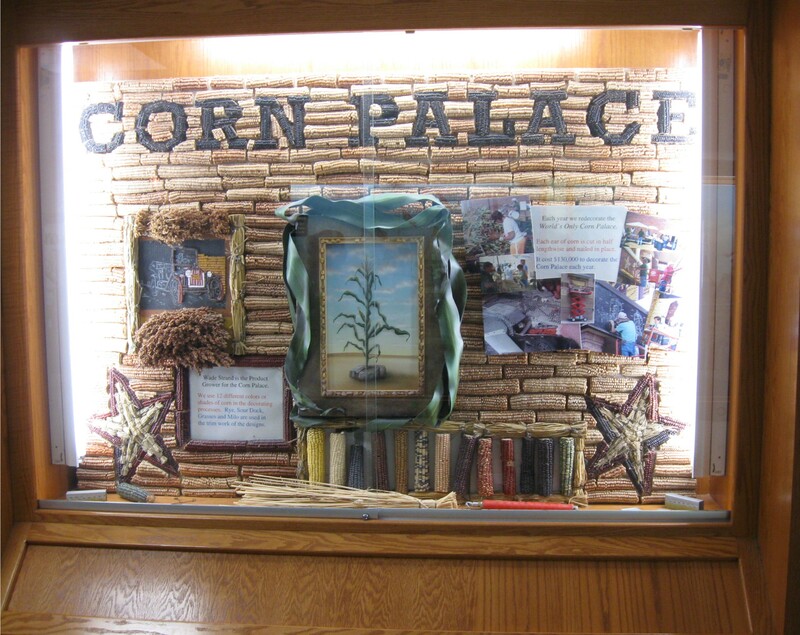 Inside, glass display cases exhibit the means and methods for creating corn art. Much effort and creativity are required; not just anyone can cobble this stuff together. 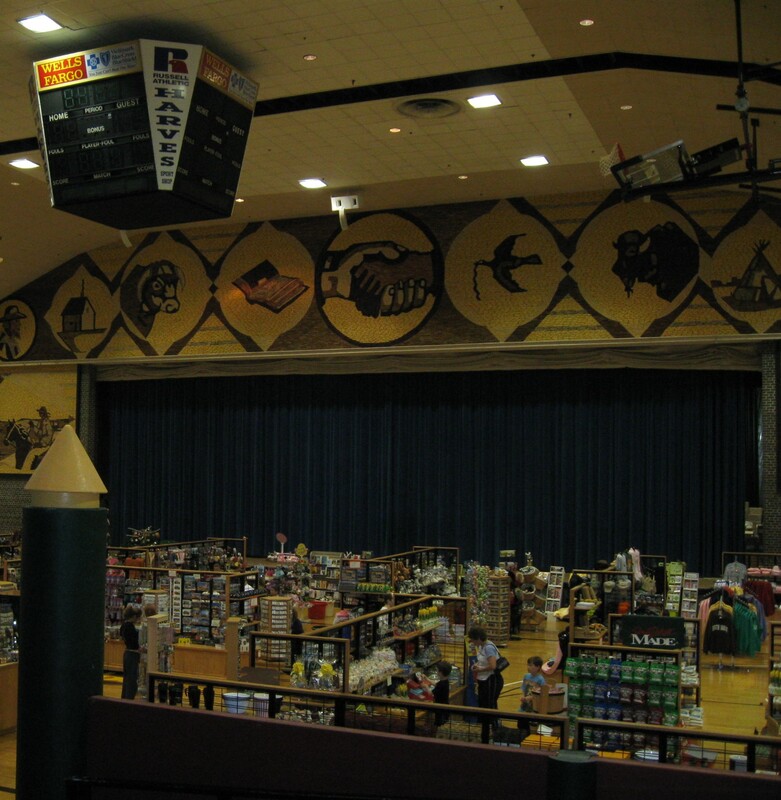 Inside the Corn Palace is a modest basketball arena used to house an extensive gift shop, which sold a combination of corn-themed knickknacks, souvenirs, and for some reason a variety of books. As I recall this was the first place I ever noticed copies of the Diary of a Wimpy Kid series for sale. 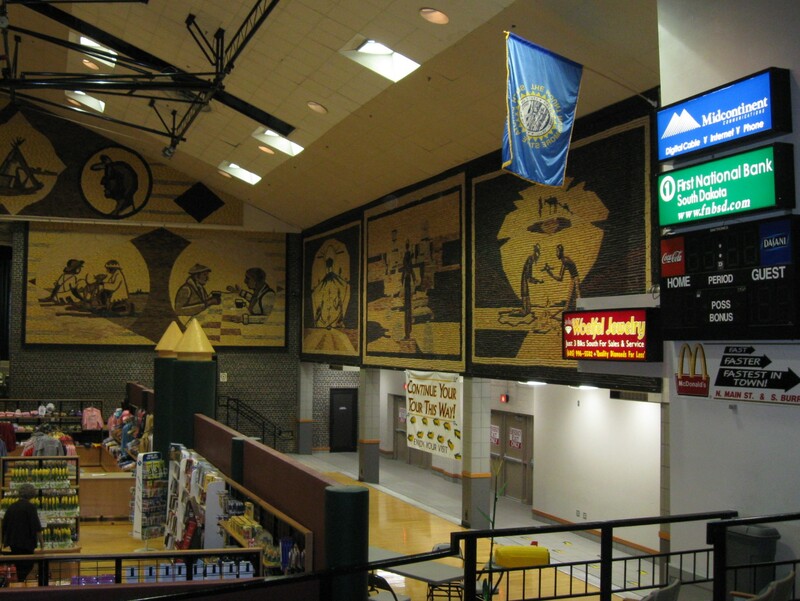 Above the sales floor hang retired corn murals from years past. 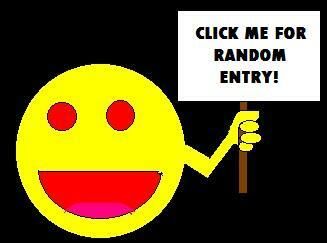 …without my amateurish use of well-meaning but wholly optional and somewhat flawed technology. I’m just not the guy to make his own corn films. 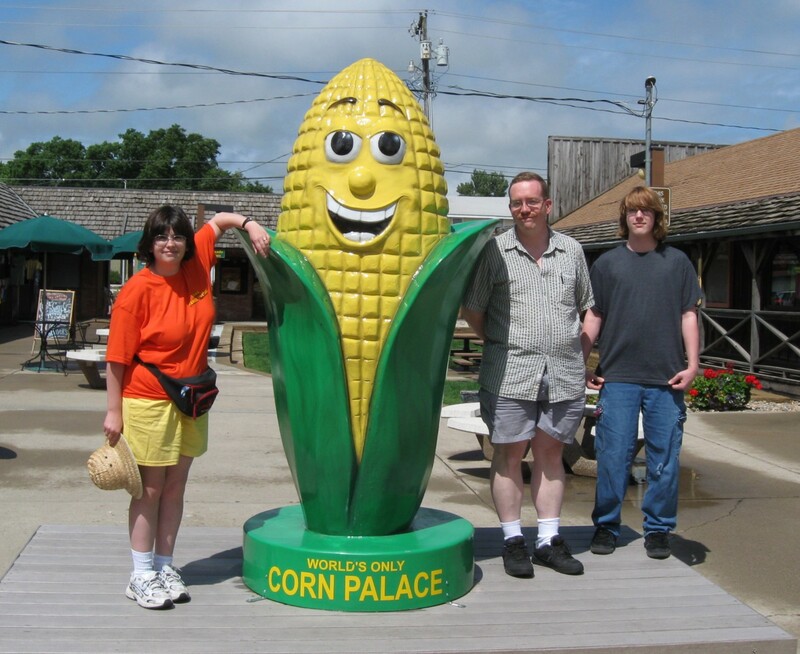 Another helpful traveler took this photo of us hanging out with Cornelius the local quadriplegic mascot and Veggie Tales understudy. 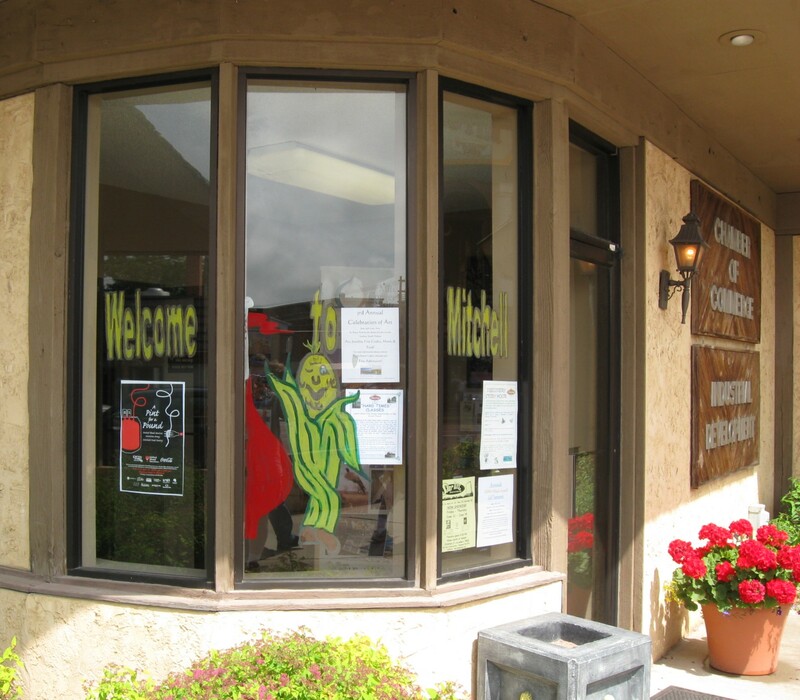 We appreciated the efforts that the people of Mitchell put forth to create such a unique place. We thought the diversion was worth it, and priced just right so we didn’t leave feeling like we’d been cornswoggled. 1. 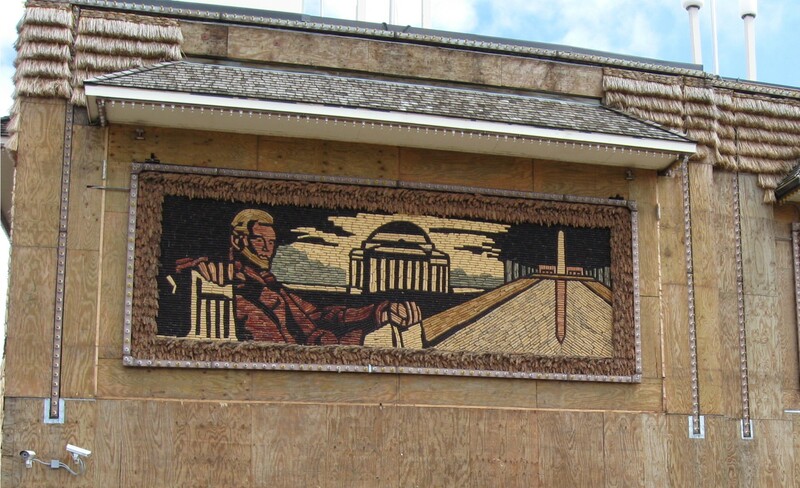 The husk of the Enchanted World was bought years later and, with minor modifications to its amazing exterior, reborn as a Christian-themed attraction called Valtiroty Shiloh’s Tabernacle, a Bible Park possibly like the one Ned Flanders opened that one time.